Skiathos is connected to Skopelos with frequent ferry itineraries during the summer season. The distance between the two islands is approximately 12 nautical miles and the journey has an average duration of 30 minutes. Ticket prices for passengers range from € 6 to € 15. How long is the ferry ride from Skiathos to Skopelos? These two islands are part of Sporades, which are located at the west Aegean Sea. Depending on the ship, the trip lasts about 30 minutes. 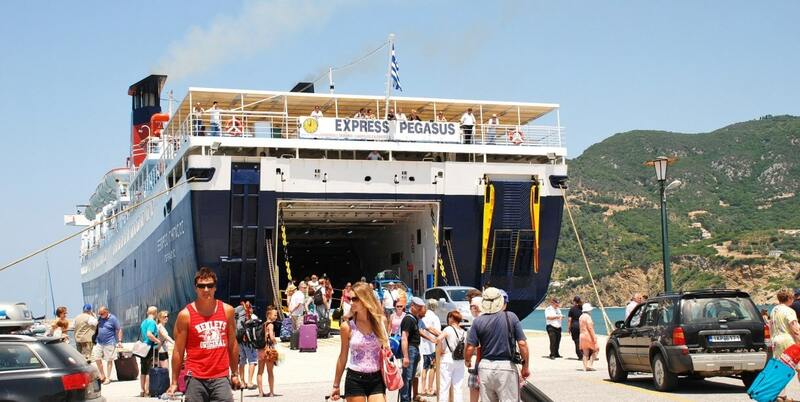 During the summer there are many ferries serving daily from the port of Skiathos to Skopelos. Ferry ticket prices range from 6 to 15 euros for the regular passenger ticket, depending on the ferry company. The price ticket of a medium car costs about 20 euros, while an indicative price for transporting a bicycle is just 3 euros. The islands are close to each other and Skiathos is about 21 km or 12 nautical miles from Skopelos. The islands of Sporades (Skiathos, Skopelos, Allonissos, Skyros) are near the mainland of Greece, close to Volos. The island of Skopelos has two main ports: Glossa and Skopelos. Depending on the weather and the wind, disembarkation can happen to a different port than planned, so it is advisable to crosscheck the port of arrival/departure with the port authorities. You can reach the Sporades islands through various ports of the mainland of Greece, such as Agios Konstantinos, Mantoudi, Kymi, but not Piraeus or Lavrio. If you are visiting Skiathos and Skopelos consider travelling to the nearby Allonnisos, which less crowded and wildly beautiful during the summer. The ferry trip from Skiathos to Skopelos can be very surprising. If you have deck seats you may be lucky enough to see dolphins swiming alongside the ferry boat!